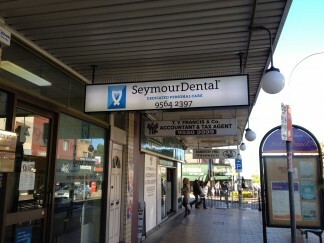 The friendliest expert dental practice in the Inner West! Although we’re located in Dulwich Hill in Sydney’s Inner West, our patients come from far and wide to enjoy our expert dental treatment and friendly, relaxed environment. 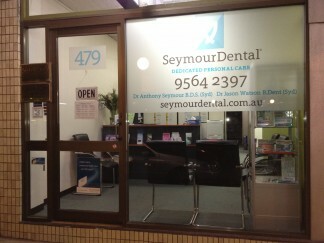 You’ll find Seymour Dental nestled comfortably at the New Canterbury Road end of Marrickville Road, next to the chemist and opposite the Australia Post Office and the Commonwealth Bank, at 479 Marrickville Rd, Dulwich Hill. While you’re here, why not sample the many cafes and restaurants, or even explore Glee books. Below are tips on the many ways of getting to the practice. For people from the Eastwood area, to get here by public transport get the train to Burwood, then take the 418 bus at the front of the station – it goes to Tempe. It runs along New Canterbury Road. Get off at the intersection with Marrickville Road. By car from Eastwood, look below at ‘Getting there – by car‘ and click the ‘Travelling from the North West‘ link. This is a shortcut map we have specially made to avoid traveling along busy roads. Use ‘street view’ to see pictures of intersections along the way. 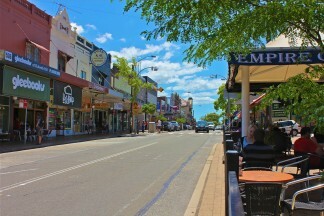 The number 426 bus stops in front of Seymour Dental via Marrickville Road and through to the City via Stanmore, Enmore and Newtown. The number 428 bus stops just at the corner of New Canterbury Road and Marrickville Road, a few minutes walk to Seymour Dental. 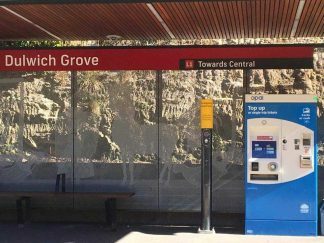 Either take the train to Central Railway Station, or walk to Railway Square and take the 426 bus that terminates at the Dulwich Hill shops. The surgery is on the right hand side of the road opposite the Commonwealth Bank. Or take the train to Sydenham Railway Station and walk to the bus stop at Victoria Road Near Marrickville Road around 700 metres. Then take the 426 bus which terminates at Dulwich Hill shops. 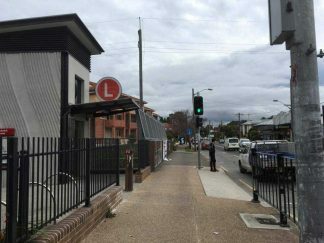 The Dulwich Hill Line numbered L1 and also known as the Inner West Light Rail, is a light rail line in Sydney, running from Central railway station through the Inner West to Dulwich Hill. The nearest station is Dulwich Grove which the second last stop before the end of the line. The train timetable shows that from Central to Dulwich Grove is about 35min. The stop has a lift that takes you up to New Canterbury Road. There you will see the large “L” sign. Turn right and walk till you get to the second set of traffic lights. 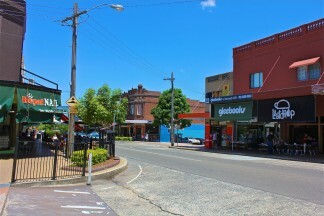 This is Marrickville Road, (where the pub is on the corner – The Gladstone Hotel), turn right, and just as you pass the Commonwealth Bank, and we are across the road. Cross the road at the nearby raised pedestrian crossing and you’ve made it. It is a leisurely 10min walk to our practice, and most is under awning coverage. Visit the RTA website or review directions on Google Maps for directions on how to reach Seymour Dental by car. We’ve also include extra driving directions from different areas of Sydney. Use ‘street view’ to see pictures of the intersections along the way. There’s a FREE two-hour council car park at the rear of Seymour Dental in Seaview Street. Another four-hour car park is located just 50 metres back from this. Both parking areas are on ground level. The practice is located on ground floor level with just one small step. Our staff will be happy to help you enter the practice. We’ve got the Inner West covered! Abbotsford, Alexandria, Annandale, Arncliffe, Artarmon, Ashfield, Balmain, Balmain East, Balmoral, Bellevue Hill, Birchgrove, Bondi, Bondi Beach, Bondi Junction, Bonnet Bay, Breakfast Point, Brighton-Le-Sands, Bronte, Burwood, Camperdown, Cammeray, Canada Bay, Canterbury, Chatswood, Chatswood West, Chippendale, Clontarf, Clovelly, Coogee, Cremorne, Cremorne Point, Cronulla, Crows Nest, Daceyville, Darling Point Darlinghurst, Darlington, Double Bay, Dover Heights, Drummoyne, Dulwich Hill, Earlwood, Eastgardens, Eastwood, Edgecliff, Elizabeth Bay, Enmore, Erskineville, Eveleigh, Five Dock, Forest Lodge, Glebe, Greenwich, Haberfield, Haymarket, Homebush, Homebush Bay, Homebush West, Hurlstone Park, Kensington, Killara, Kingsford, Kirribilli, Lane Cove, Lavender Bay, Leichhardt, Lewisham, Lindfield, Lilyfield, Liverpool, Manly, Manly Vale, Malabar, Maroubra, Marrickville, Mascot, Matraville, McMahons Point, Millers Point, Milsons Point, Mosman, Neutral Bay, Newtown, North Bondi, North Sydney, Paddington, Parramatta, Petersham, Point Piper, Potts Point, Pymble, Pyrmont, Queens Park, Randwick, Redfern, Rhodes, Riverview, Rodd Point, Rose Bay, Rosebery, Roseville, Rozelle, Rushcutters Bay, Russell Lea, St Leonards, St Peters, South Coogee, Stanmore, Strathfield, Strathfield South, Summer Hill, Surrey Hills, Sydenham, Sydney, Tamarama, Tempe, The Rocks, Ultimo, Vaucluse, Waterloo, Watsons Bay, Waverley, Waverton, Wollstonecraft, Woollahra, Woolloomooloo, Woolwich, Zetland.